For delicious recipes, visit www.pilgrimschoice.com or join us on Facebook, Twitter and Instagram. Like you, we think the world should be packed full of flavour. We're anti-bland and pro-punchy, in cheese and in life. It's how we think, act and it's how our cheddar will always taste. Our Mature Cheddar is rich, smooth and wonderfully well rounded. 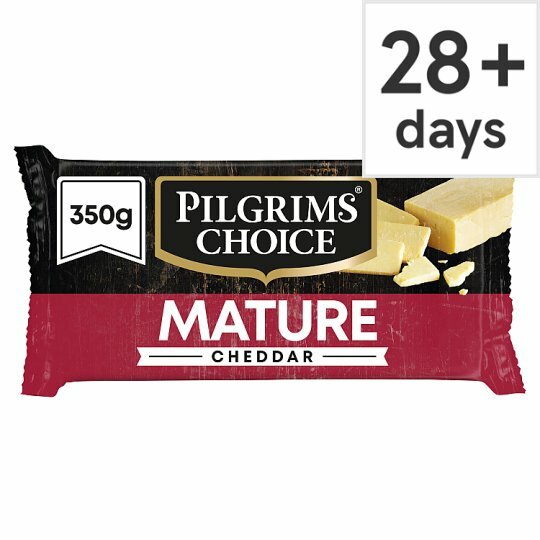 No matter whether you're a cheese lover, a taste enthusiast or a midnight fridge raider, we promise to always strive to fill your life with flavour with the unapologetic, unashamed, unmistakable taste of Pilgrims Choice. Pilgrims Choice. Fill your life with flavour. Produced in the UK and Ireland, using milk from the UK and Ireland. Packed in the UK. Try it crammed into a toastie, oozing in a mac n'cheese or cut a slab and wedge it into your next burger.